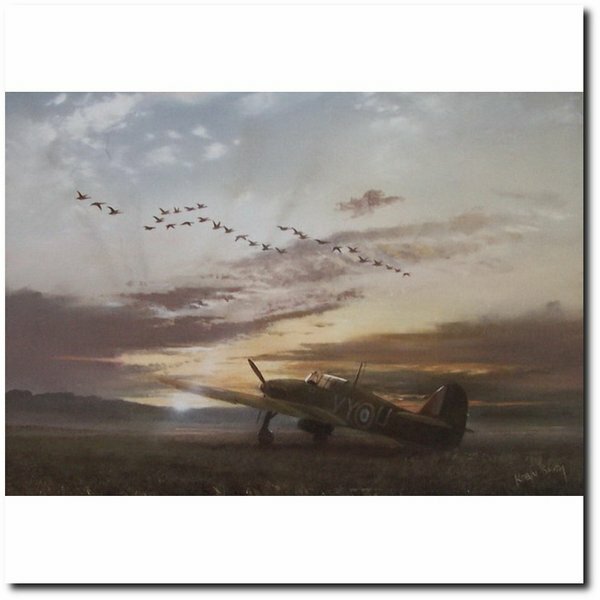 Sitting resplendent in the evening sunset, the Hawker Hurricane rests between sorties. Almost like a wild animal in its natural habitat it waites patiently to get another bite of the cherry. Few people realise in fact that the Hurricane shot down twice as many enemy aircraft as the Spitfire during the Battle of Britain. Being of traditional construction including wood and fabric it could withstand tremendous battle damage and keep fighting on. How many hundreds possibly thousands of years have those geese been flying over the same fields oblivious to the raging war. I thought this touch completed the painting and added a wonderfull contrast.